A previous post presented how those characteristic summer chorus of the English countryside may be soon an event of the past. This rapid decrease in the population of migratory birds in the UK was attributed to habitat destruction and other such anthropogenic factors, probably somewhere along the migration corridor. So what does habitat destruction and other anthropogenic influences bode for migrating organisms? Vishwesha Guttal and Iain Couzin, of Princeton University, try to predict this (amongst other interesting stuffs) via models explained in their paper on ‘Social interactions, information use, and the evolution of collective migration’, an interesting read, although a tad too technical for the layman. Organisms, all along the phyla of the animal kingdom, are believed to migrate as a result of detecting and responding to factors governing resource availability. The foundational theory considers each migrating individual as “‘information processing units’, with interactions amongst them providing collective benefits”, such as improved migratory direction. Should an individual commit an error in the information processing, the aforementioned grouping would average the individual measurements, so as to deduce the mean migratory direction. -Leaders, who have a higher ability to detect and respond to directional gradient from the environment, but with weak (or none) social skills. 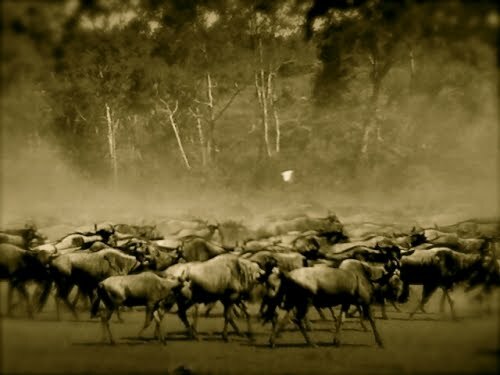 They tend to occupy frontal or peripheral positions and expend more energy in trotting off the beaten track and facing dangers such as predators. -Social individuals, who have strong social skills but weak ability to detect and respond to gradient. However, they utilise the strengths of the leaders for a free ride. Anthropogenic factors have been exerting pressures (such as habitat fragmentation and changes in population density) on the existence of many migratory species (examples cited in the paper includes: American bison and its steep decline in its population density; extinction of passenger pigeon) and migratory patterns (Blackcaps becoming resident; Eastern house finch exhibiting the reappearance of lost migration). As habitat fragmentation increased, the individuals adapt their migratory strategy by travelling longer distances to find an appropriate habitat. The researchers’ model predicted that in such cases, paradoxically, the population’s migration ability reduces relatively gradually with increasing habitat fragmentation. The reasoning is that: ‘at high levels of habitat fragmentation, no individuals evolve to be leaders, and therefore, the population loses its migratory ability. Even after restoring the habitat, a population’s migratory ability does not recover at the same habitat quality at which it declined due to the relatively short time scale of these changes’. As for human migration and habitat fragmentation: prior to the age of transportation, I suppose that habitat fragmentation might have reduced human migration, unless the humans were desperate. In the current age, I doubt if this holds- practically, all regions are accessible.